Brown & Reaves Services, Inc. is a family owned company with years of experience and deep industry expertise. As your local Myrtle Beach air conditioning and heating repair contractors we specialize in all aspects of HVAC services, from installing a brand new system to repair and maintenance of your existing equipment. An efficient cooling and heating system in your house or office is crucial for a comfortable and healthy environment. That is why, for over 40 years, we’ve committed ourselves to deliver only the highest quality service to our customers. 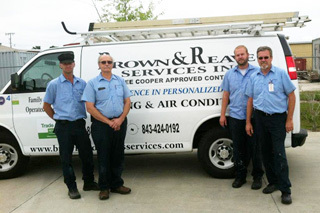 Our technicians at Brown & Reaves Services, Inc., are highly trained and certified in all aspects of the HVAC industry. Our technicians received a NATE (North American Technicians Excellence) certificate by passing a nationally recognized test regarding all aspects of the heating, ventilation and air-conditioning industry. NATE is the largest, independent, non-profit organization testing real wold working knowledge. NATE-certified technicians ensure maximum system efficiency and have 28.4% less product returns. As Myrtle Beach air conditioning and heating contractors we are a long time member of RSES (Refrigeration Service Engineers Society). Established in 1933, RSES provides training and education in all of aspects of the HVAC field as well as the latest solutions and technological advances. We are certified by the NCI (National Comfort Institute) in duct design and balancing. We are also certified by the BPI (Building Performance Institute) in identifying and correcting problems in your house which may cause air leakage. Air leakages force your cooling and heating system to overwork, shortening its life and even causing mold or mildew. Brown & Reaves Services, Inc. is certified in Manual J, S, & D load calculation for your home to make sure the system is a perfect fit and saves you energy. We are also certified in Duct Blasting to check your existing ductwork to assure that your are not wasting energy through leaking ducts. If you’re searching for highly certified and trained professionals who know the area and have years of experience, consider our team of Myrtle Beach air conditioning and heating contractors. Call Brown & Reaves Services, Inc., at 843-497-9867 or use our contact form. If you’re a first time customer don’t forget your 20% OFF coupon on our service call.